Protagonisten für TV Beitrag gesucht! 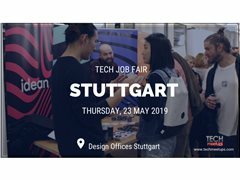 Our Tech Job Fair in Stuttgart is taking place on 23th May 2019 and we need some help with event promo at the spot. We'd have T-Shirts printed for all our team members, including you, and you can welcome people in and hand out brochures. This would be from 6pm until 9pm, but you are welcome to stay at the event, free beer and snacks included!